I’ve got an idea that’s been bouncing around in my head for a while now, and it’s time to get it out. The idea is to create a little notebook of sketchnote skill building activities – small things that you can do to build up your drawing and listening skills, little by little, in a low pressure and enjoyable way. 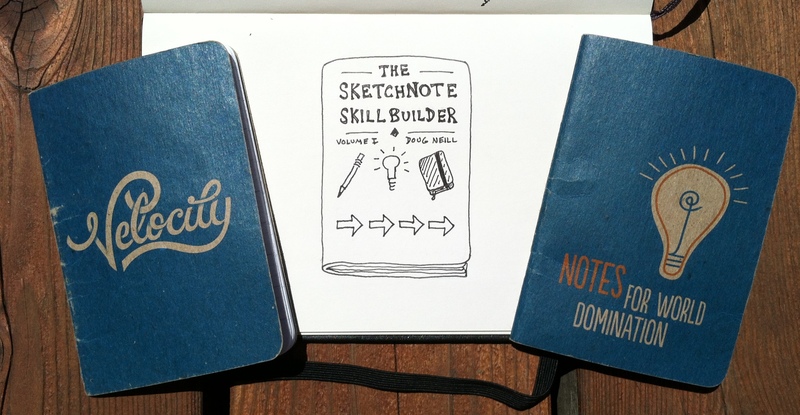 I’ve decided to call this notebook The Sketchnote Skill Builder. The thing that I struggled with the most when I first started sketchnoting was the anxiety and subsequent paralysis that I felt when I tried to sketchnote something in real-time. The goal of this skill building notebook is to ease those tensions by providing activities that focus on one aspect of sketchnoting at a time so that you can build individual skills and then apply those skills to the sketchnotes that you create for yourself. This project combines my interest in sketchnoting with my passion for teaching. I’ve already brainstormed most of the activities, so now it’s just a matter of putting pen to paper and sketching out the book. I am envisioning this book as a smaller and self-published cross between Mike Rohde’s The Sketchnote Handbook and Michael Nobb’s Drawing Your Life (if you haven’t already done so, go check out both of those books right now!). I’m thinking of going with a Scout Books-style notebook (like the two in the image above) that is small enough to fit in your pocket and also rough enough that you won’t feel any hesitation drawing in it. I’ll also create a digital version for those sketchnoting on tablets or those who already have a favorite notebook within which they’ll want to complete the activities. I’ll post periodic updates to share my progress on this project. You can find those updates on The Sketchnote Skill Builder page of this site. If you want to receive updates via email, sign up for The Verbal To Visual Newsletter. In the next update I’ll let you know about my process for creating the book, and what new skills I get to learn to put it all together!